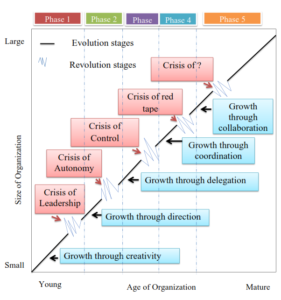 Following figure presents the various stages of organizational growth. The founders of the organisation dominate this stage, and the emphasis is on creating both a product and a market. These founders are usually technically or entrepreneurially oriented and they absorbs their mental and physical energies entirely in making and selling a new product. But as the organisation grows, management problems occur that cannot be handled through informal communication and dedication. Thus the founders find themselves burdened with unwanted management responsibilities and conflicts arises. It is at this point that the leadership crisis occurs and the first revolutionary period begins. Who is going to lead the organisation out of confusion and solve the management problems confronting the organisation? Who is acceptable to the founders and who can pull the organisation together? Such questions arise and in order to solve these problems a new evolutionary phase i.e. Growth through direction begins. During this phase, the professional managers and key staff take most of the responsibility for instituting direction, while lower level supervisors are treated more as functional specialties than autonomous decision-making managers. Thus, directive management techniques enable the organization to grow, but they may become ineffective as the organisation becomes more complex and diverse. Since lower level supervisors are most knowledgeable and demands more autonomy in decision making, a next period of crisis i.e. crisis for autonomy begins. In order to overcome this crisis, the third phase of growth – Growth through delegation emerges. Resolution of crisis for autonomy may be through powerful top managers relinquishing some of their authority and certain amount of power equalization. 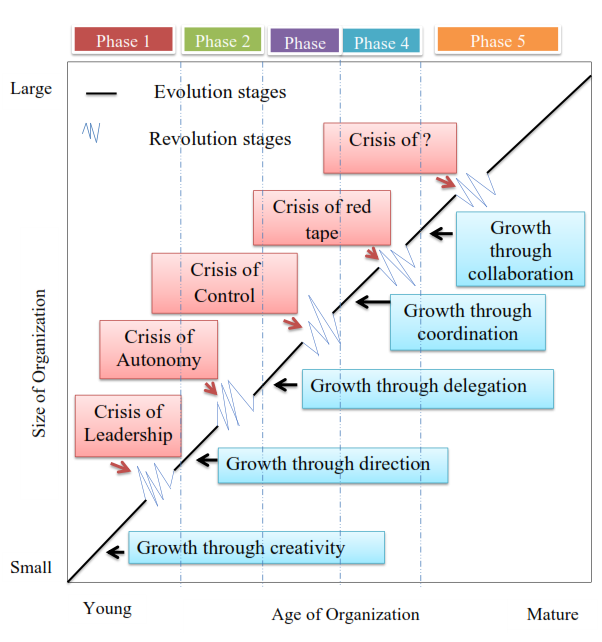 When the organisation gets to the growth stage of delegation, it usually begins to develop a decentralized organisation structure which heightens motivation of the lower levels. However with decentralization of authority to managers, top executives may sense that they are losing control over a highly diversified operation. Field managers want to run their own shows without coordinating plans, money, technology, or manpower with the rest of the organisation and a crisis of control emerges. The crisis can be dealt with the next evolutionary phase i.e. the coordination phase. My wife and i were really fulfilled Raymond managed to finish off his web research out of the precious recommendations he got from your very own web pages. It’s not at all simplistic to just choose to be giving for free thoughts which a number of people might have been trying to sell. And now we fully grasp we need the website owner to be grateful to for that. Most of the illustrations you have made, the simple web site navigation, the friendships you assist to foster – it’s got all superb, and it’s really helping our son and our family know that the topic is fun, which is certainly extraordinarily important. Thanks for the whole thing!